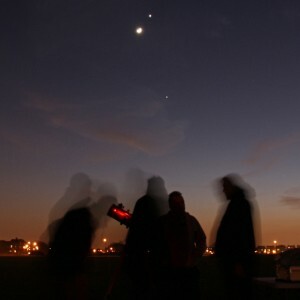 Our scheduled observing session on the 19th coincided with a spell of clear skies that offered good seeing and a little bit of breeze to keep the dew away. Despite the best efforts of the Shard, which was lit up like the proverbial Christmas Tree. We were able to observe a selection of deep sky objects. In addition to the scopes bought by other members I brought a 6″ APM doublet refractor to share with visitors. We started by observing M31 (Andromeda) together with its satellite galaxy M110. I then moved on to M42 (Orion Nebula) which offered a good view but was still a little low in the sky and hence drowned out by the band of orange murk hanging over South London. Therefore I turned my attention to the clusters. The first targets were M38, the Starfish Cluster, followed by M36, the Pinwheel Cluster. The former certainly being more visible than the latter. I then moved my attention to NGC2264, the aptly titled Christmas Tree Cluster which contains the Cone Nebula, an object considered to be difficult to see visually. I would have to agree as I could see nothing! I could barely make out the tree shaped star formation. Oh well! Moving on (and noting that we were now attracting a reasonable crowd), I looked for some more targets to share. Targeting M35, a cluster in Gemini did not disappoint, being easily visible and offered a nice selection of different star colours. I then moved on to M44, the Beehive Cluster, one of my favourites for its normally very obvious mixture of blue and yellow stars. While colour was visible, it was still challenged by its low altitude so colours were a little muted. Something to revisit in a few weeks. All these objects were viewed with a 13mm / 100 degree eyepiece (92x). Now for something different. Uranus was still well placed so it was time to ramp up the magnification for this distant object. Having located it I proceeded to increase magnification, finding that an 8mm TMB (150x) seemed to offer the best combination of size, sharpness and colour, which was a pale green but without any visible moons this time, unlike our last visit to Martin and Jane’s in Romney. With more objects getting higher and into the darker part of the sky, it was time to target M45, the Pleiades. For this I borrowed a 21mm eyepiece (52x) from Mike which offered a superb view of this popular object. Jupiter had now risen high enough to be free of most, if not all, of the dispersion caused by the atmosphere. As ever it rewarded with an excellent view displayed with the moons Callisto and Ganymede, Io and Europa being in transit. Finally, with the night drawing to a close and Orion well placed high in the sky, I went back to M42, this time with the 21mm. This was perhaps the most memorable view of the night. The nebula standing out against the star field with the trapezium clearly visible. The field of view offered by the 21mm also allowed the attractive double of Sigma Orionis to be part of the display. All in all we were able to share a good selection of objects with visitors. Many thanks to Mike, Tej (despite forgetting his focuser!) and Barry plus anyone else I did not get to say hello to for turning up with scopes and all those who attended. Wishing you all a brilliant 2015 filled with clear skies.